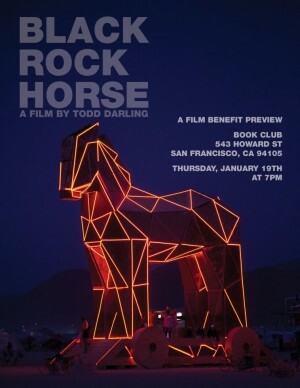 Todd Darling’s film “Black Rock Horse” is in the final stages of production! A team of artists at Burning Man ask volunteers to pull a 50 foot high Trojan Horse across a dry lake bed. The procession becomes a stampede when 600 “Greek Slaves” revolt. Black Rock Horse reveals the inner workings of a complex art project and the epic struggle to create. We are very proud to announce that Todd’s film has been accepted to the 2012 Big Sky Film Festival in Missoula, Montana, and will be featured in the category “Art Is – New Films about Art & Artists”, screening Thursday, February 23. The film still needs funds to finish. Specifically: graphics, After Effects, the cost of mix, color correction and Blue Ray authoring need to be covered. We have a good start on these funds, but we’re still in need of a bit more. Big Thanks in advance for your generosity. Please follow this link to Pay Pal. Posted on January 29, 2012 by trojan	in Updates and tagged Black Rock Horse, documentary, Todd Darling. I am always browsing online for articles that can facilitate me.